The 2019 4-H/FFA Dairy Judging Contest will be held on Saturday, March 9, 2019 at 10:00am at the Hupp Dairy Farm in Croton. During this event, the Licking County 4-H Junior and Senior Dairy Judging Teams will be selected to compete in the 2019 State Dairy Judging Contest. Youth ages 8 and in third grade through 18 (as of 1/1/19) are encouraged to participate. There will also be a Dairy & Dairy Feeder Quality Assurance training the same day at noon in the Babcock Building on the Hartford Fairgrounds. Please remember that members who take livestock projects must attend a Livestock Quality Assurance Training each year in order to be eligible to show at the Hartford Fair. All 4-H Horse Project members must take a Horse Safety & Ethics training their first year of enrolling in a horse project. The following dates are still available for members to attend in Licking County. There are also several state and out-of-county opportunities for members to attend. Licking County members must have completed this training by June 1st. 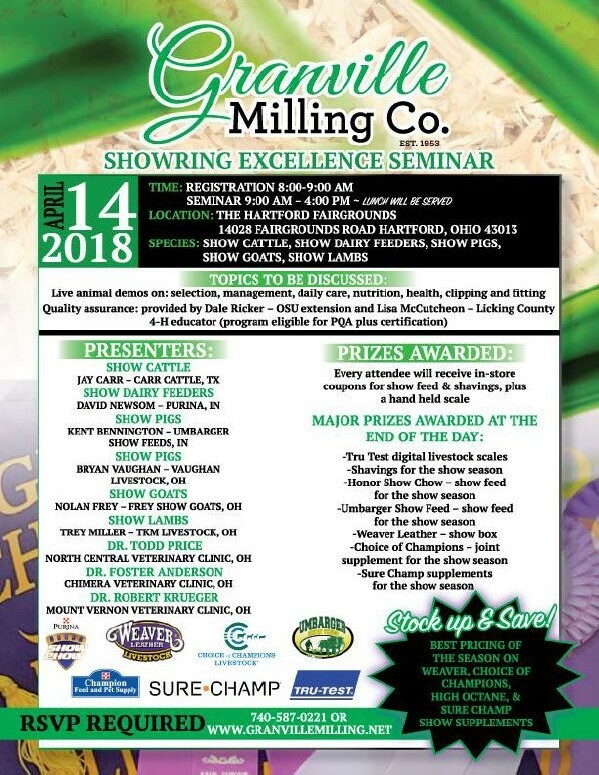 This event on April 14th is open to all 4-H members as an opportunity to help prepare you for fair and the show ring. We hope you can take advantage of this opportunity.